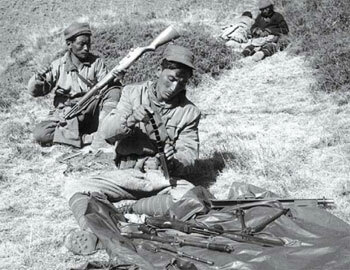 THE INSURGENTS: Khampa fighters in Mustang (above and below) prepare for an attack on Chinese forces in June 1964. George Patterson had been a missionary in Kham in eastern Tibet and spoke the dialect well. Along with documentary maker Adrian Cowell and cameraman Chris Menges, he was keen to film Khampa fighters in Mustang carrying out a raid so he could show the world that Tibetans were still fighting the Chinese. The build up of the Khampas in Mustang was a badly kept secret. The Indians were getting worried that a buildup of Tibetans on Nepal’s northern border could lead to China sending troops into Nepal. The first two CIA airdrops of arms from Hercules aircraft 10km inside Tibet took place in April and December of 1961. The third and final drop was made into Mustang in May 1965 by a DC-6. The Khampas had suffered heavy losses: of the 49 parachuted into Tibet, 37 were killed in action against the Chinese. The same heavy attrition occurred when the CIA shifted their point of effort in early 1964 to infiltrating small groups of Khampas into Tibet on intelligence missions. Four members of one of these groups were arrested in Kathmandu in June 1964 following a brawl. One of Duff’s dispatches gives the detail of this arrest as told to him by the Inspector General of Police, PS Lama. Lama told Duff that the Khampas were trained abroad and were on their way to the border. He also gave Duff a list of sophisticated surveillance and communication equipment taken from the Tibetans which, they said, had been given to them in Kathmandu by Hugh McDevitt who was employed as the manager of “Air Ventures” which operated two helicopters for the United States aid mission. The Nepali authorities knew what was going on in Mustang, and who was backing the Khampas with money and material. There was therefore no chance that the Nepal would allow Patterson anywhere near Mustang, but they underestimated the man’s guile and determination. In his book, A Fool at Forty, Patterson describes the web of deceit he spun in Kathmandu about his real aim beneath the cover of making ‘a tv film about Nepal’. Patterson saw most of the key people: Tulsi Giri, the Chairman of the Council of Ministers, Prakash Thakur, the Chief of Protocol, Mr Banskota, the Director of Publicity, and General Padam Bahadur Khatri, the Foreign Secretary. He also had a two-hour meeting with Mahendra's brother, Prince Basundhara. Patterson clearly pulled the wool over all their eyes as he quickly got permission to start filming in and around Kathmandu. His application to go Mustang was refused, and he obtained a permit for ‘a trek to Pokhara’ but left the trail at Arughat to walk north up the Budi Gandaki, and after passing the Indian wireless station at Setibas, headed up the long, steep trail to Tsum. Contact was quickly made with a small Khampa group which had one bren gun, eight rifles and no means of communication. Tendar, their commander, had led reconnaissance sorties across the high snow passes to monitor traffic on the Dzonkha to Kyrong road but, little offensive action had taken place. A July 1964 dispatch from Duff reported a meeting he had with Michel Peissel, the Himalayan explorer and author, who told him that there had been no raids across the border since early 1963. Still, Patterson persuaded Tendar to carry out a raid so he could film it. With his eight lightly armed men and the three foreigners, he crossed the high passes and on 9 June 1964 ambushed a PLA convoy, killing eight Chinese soldiers. In his book, Patterson gives a detailed description of the raid, which was successfully filmed. The team returned to Kathmandu on 27 June, and Cowell dispatched the footage of the raid on the first plane out to East Pakistan. A few days later, the three of them went to see Duff to confess all. Cowell and Menges were dubious but Patterson agreed that Duff could pass the information to King Mahendra at an audience already fixed for the evening of Friday, 3 July. One of his two telegrams that day stated that he was going to inform the US ambassador, and it would be reasonable to assume that this is when the CIA would have been first known about the raid. At this stage the UK was still accepting categorical denials from the US that it was not involved in support for the Khampas. That same morning, as previously planned, Cowell and Menges left Kathmandu to drive overland to India via Raxaul, but were detained overnight at the border. Some innocuous film footage and audio tapes were confiscated, and Duff reported that the palace had given the order to release them without informing the Foreign Secretary. At the same reception Mahendra said that the film ought to be stopped. Duff told him this was not possible. Patterson and Cowell had told Duff that they would wait for three months before showing the material, but the finished film called Raid into Tibet was not shown on British TV until 1966. George Patterson, a Scottish engineer and missionary, led the covert effort to film the ambush which was later made into Raid into Tibet. Patterson was clearly not prepared to sit on his story. 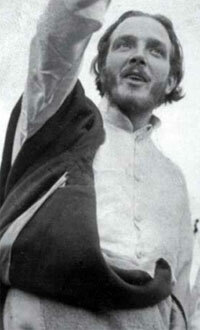 In March 1965 he wrote a lengthy propagandist-style article on the raid in The Reporter, an American magazine describing the ambush in graphic detail. Large extracts appeared in the Hindustan Times, under the heading ‘Nepal-based Khampas harass Chinese’. The files show that the articles caused concern among British officials which suggests that perhaps ATV, the independent company who finally transmitted it in UK, had been persuaded to delay showing the film. Duff had argued a better outcome might be achieved by taking a conciliatory approach with Patterson. Mahendra and the palace were receptive, but Padam Bahadur Khatri wanted some measure of retribution. Two weeks later police prevented Patterson from flying out, and when Duff complained no one in Kathmandu could or would identify who had given the order. Patterson was allowed to leave three days later, having signed a five line note saying essentially that he was sorry for straying from his trekking permit. ‘Why that curious little statement should have satisfied anyone is merely one of the many mysteries about Nepalese behaviour throughout this affair.’ That comment from Duff’s final dispatch seems an apt way to end this tale as it also neatly conveys the opaqueness of government during the Panchayat days which so confused outsiders, and so suited the monarch. In addition to the UK archive material and Patterson’s book other information about Tendar and the Khampas in Mustang comes from The CIA's Secret War in Tibet by Kenneth Conboy and James Morrison. Sam Cowan is a retired British General who knows Nepal well through his Gurkha connection and extensive trekking in the country over many years.